To be honest I use OpenVPN quite rarely on my Android tablet, and it happens only when I need to access certain locations that tie me to a certain IP address. This type of connection could be more often used when the tabled would serve as an email reading device at a company that would restrict email usage without a VPN. As a good guy the first thing I do is to google the message and what I get are only stupid answers like “brackets inside the config file are wrong”. I take a look in my config file, there are absolutely no brackets. WTF!? 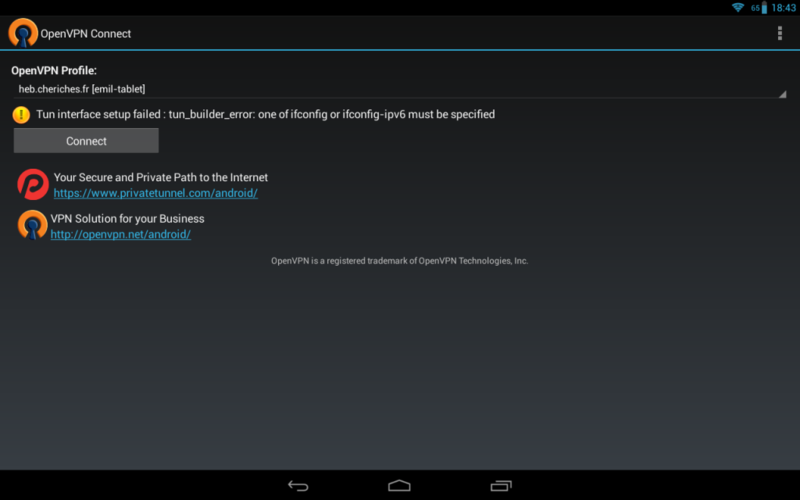 Sorry, but the Android VPN API doesn’t currently allow TAP-based tunnels. I ended up creating a new config on the server, to make the connection on a different port, using tun-based configuration, and reversed tablet’s configuration to using tun-based interface. I’m running into this same issue except my server config isn’t using a tap device. Would you be willing to post your server and client config files? Thanks, that did it! Changed a few of my settings to match yours and this connection oddity disappeared. Thank you, i think solved mine too.